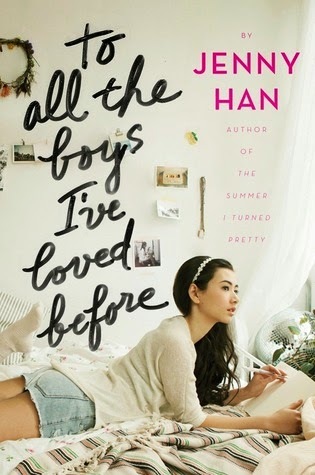 Review: If you have never read a book by Jenny Han then you need to get on that. This has been my favorite of her books so far. I really connected with Lara Jean, she enjoys being with her family and is not one of those teenagers that is always trying to get away from her life. I don't think there are enough of those in YA right now and it was fun to see another side of teens. I also really liked how she wrote those love letters. A lot of the time when you really like someone it is good to get all the thoughts out of your head so you aren't fixating. I don't know if I would have addressed them though! I don't have any sisters but I think Jenny Han nailed a family relationship. Yes, every one's relationships are different but this one was just real enough that I fell in love with Kitty, Lara Jean, Margot, and their dad. This was not a gritty, tough contemporary novel, (which you can probably tell from the cover) It was light and fun but also dealt with some interesting dynamics between families, boys and girls, and finding yourself once you stop being overshadowed by someone else. This book is everything I love in a good YA contemporary. It is fun, but really investigates finding out who you are, which is something I still deal with, and I know I dealt with it as a teen. Overall I loved this book. So if you are looking for a sweet clean read this book is for you!